I like it Dave. A topic that's been in my head this last week or so too. 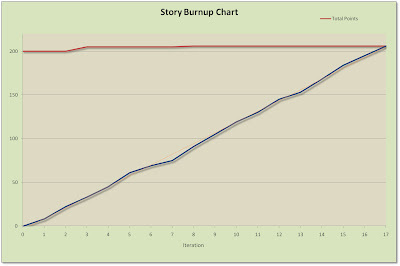 The line on the burn-up chart is very similar to the bottom, "done" line on cumulative flow charts in Kanban. 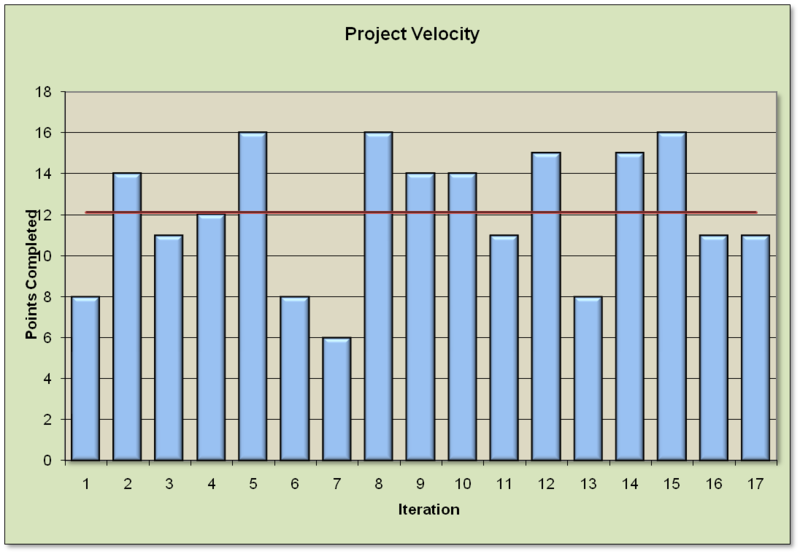 (Although in Kanban, those charts are done daily rather than once in an iteration, so the line is not as smooth.) The slope of the "done" line equals throughput. Consistent/increasing/decreasing slope means the same about the throughput. Thank you for demonstrating how two seemingly different methods are, in a way, very similar. Yes - it's just the simplification of work being either done or not done with no WIP. Yep, that pretty much nails it. While reducing variation as much as possible is good, you have to understand at what level to reduce it. I agree, althugh to some extent this suggests that the period over which velocity is being measured is too small, or the pieces of work are too big (maybe). Thanks for the comment. I dunno... my experience has been that most teams' velocity will stabilize during iterations 2 to 4 or possibly 2 to 5. If you take the average of those iterations, you will have a "pretty good" prediction of long-term velocity, team changes notwithstanding. Tracking the performance of a software development team is no different, statistically, than tracking the performance of an investment or a sports team. Day to day or week to week variances are not important. It is the longer term trend that matters. Sure, consistency is a desirable trait but reality gets in the way. Some variation is expected. Wild fluctuations suggest a problem. Hi Dave... I have a question. You wrote: "Velocity is very interesting - it shows valued delivered in a certain time period.". Can you explain to me how velocity shows value delivered? Second, you can't claim points towards velocity unless a story is completed and accepted. That's business value delivered, at least from the perspective of the person who give the final acceptance. Re: velocity and value. If you complete a story and you claim it's points, what is the relationship of those points to the value of the story? Nothing... except that points completed "indicates" that value has been delivered. If I hinted that there was a direct correlation, I apologize. It wasn't intentional. @ Dave - you did imply there was a direct correlation: "Maximizing velocity is also interesting, since more value delivered to stakeholders is a good thing, right? " This is a common language error in the agile community. Product owners should not be looking at velocity (alone) to determine value delivered. In fact, it is possible that a very high relative velocity sprint delivers zero value. This could happen if the stories delivered all end up being removed later on before the software is released, which could happen simply because the product owner made a mistake. 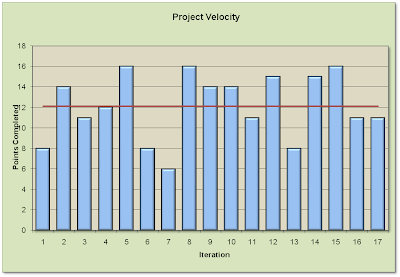 Velocity is useful for two things: prioritization and long-term planning. It is not useful for measuring value. The charts you show with the average and the slope are good for understanding when things will be delivered. This is useful to stakeholders for setting expectations about time, but not about value. 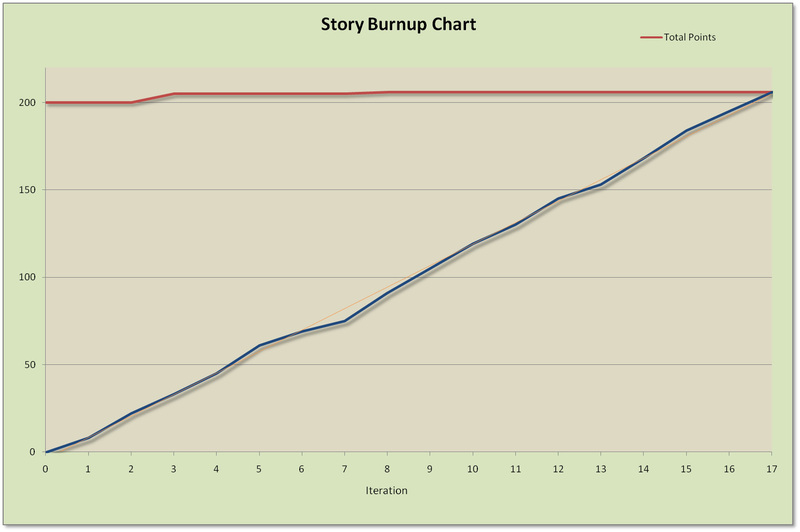 For value, the product owner needs to put estimates of "expected return" on each of the stories. If you burn this up it should look like a graph of a log function (high slope at the start, gradually levelling out). This would reflect an effective prioritization of work by ROI (expected return / effort). Points represent effort or cost. Thanks - I've updated that section of the post. Is it more clear now? I absolutely agree with the rest of tour comment. I coach teams to, as much as possible, front load the release with the "most important" stories. "Most important" can mean high business value, high business risk or high technical risk. Some groups assign a relative number like points to business value, but I believe that measurement leaves out the two risk categories. A comment says "Tracking the performance of a software development team is no different, statistically, than tracking the performance of an investment or a sports team."